Microsemi is working with MathWorks on an FPGA-in-the-loop (FIL) verification workflow with Microsemi's FPGA development boards. The integrated FIL workflow allows automatic generation of test benches for hardware description language (HDL) verification, including VHSIC Hardware Description Language (VHDL) and Verilog, providing rapid prototyping and verification of designs. The collaboration integrates MATLAB, a programming environment for algorithm development, data analysis, visualization and numeric computation, and Simulink, a graphical environment for simulation and Model-Based Design, with Microsemi’s SmartFusion2 system-on-chip (SoC) FPGA and PolarFire FPGA development boards. This allows the stimulation of designs through FIL verification workflow using Microsemi’s development boards, analyzing the results back in MATLAB and Simulink to modify the original design. Delivering the industry’s first FIL feature for Microsemi boards with MATLAB and Simulink, the collaboration provides HDL Verifier Support Package for Microsemi FPGA, a hardware support package for SmartFusion2 SoC FPGA and PolarFire FPGA development boards, and an integrated workflow from algorithms to implementation. This works with a wide variety of applications within the aerospace and defence, security, industrial and medical markets, including motor control and imaging, digital signal processing, communication systems, machine vision and imaging systems, control systems, military communications, and payload and radio processing. Microsemi’s SmartFusion2 and PolarFire FPGAs, and their complementary development boards, are available now, and MathWorks’ HDL Coder and HDL Verifier are also available now. 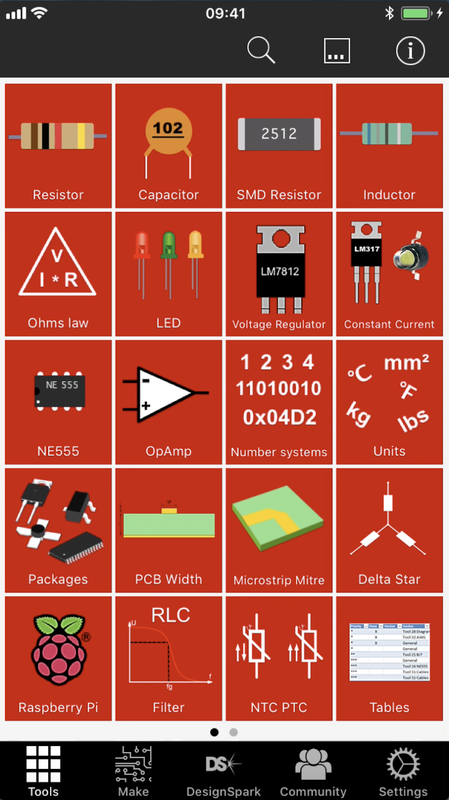 In a major move that is hailed as Microsoft's first IoT chip, the reality is a little different - and that also includes lots of use of the term 'real time'. But Microsoft is certainly trying to be responsible for the launch a new class of microcontroller. In order to provide a secure, end-to-end environment for the Internet of Things, Microsoft has developed a secure Linux-based operating system called Sphere that runs on existing ARM hardware and security hardware with secure links back to the cloud, in this case Microsoft's Azure cloud service. Azure Sphere certified microcontrollers culd be considered a cross-over class of MCUs. While Microsoft says that uses real-time cores alongside application processors with built-in security technology and connectivity, the controllers are ARM Cortex M4F-based (see below), which are suitable for many real time embedded applications but are not determinisitc cores such as the R7 family. The Sphere IoT OS offers multiple layers of security. It combines security innovations pioneered in Windows, a security monitor, a custom Linux kernel to create a highly-secured software environment and a trustworthy platform. This also does not make it a real time operating system. Azure Sphere Security Service is a turnkey, cloud service that guards every Azure Sphere device, brokering trust for device-to-device and device-to-cloud communication through certificate-based authentication, detecting emerging security threats across the Azure Sphere ecosystem through online failure reporting, and renewing security through software updates, all areas of vulnerability. Microsoft says it has been working directly with leading MCU makers to build a broad ecosystem of silicon partners who will be combining the Pluton silicon security technologies in their Azure Sphere certified chips running the Azure Sphere OS and connecting to the Azure Sphere Security Service for simple and secure updates, failure reporting, and authentication. The first Azure Sphere chip, the MediaTek MT3620, will come to market in volume this year. Over time Microsoft expects to see other silicon partners introducing their own Azure Sphere chips to the market and it is licensing the silicon security technologies to them royalty-free. This enables any silicon manufacturer to build Azure Sphere chips while keeping costs down and prices affordable to device manufacturers. The MT3620 uses an Arm Cortex-A7 application processor operates up to 500MHz and includes large L1 and L2 caches and integrated SRAM for highly efficient operation over a wider range of potential applications. Two general purpose Arm Cortex-M4F I/O subsystems support the requirements of the many on-chip peripherals including 5x UART/I2C/SPI, 2x I2S, 8x ADC, up to 12 PWM counters and up to 72x GPIO, allowing an extensively diverse potential number of applications. These two Cortex-M4F I/O subsystems are primarily intended to support real-time I/O processing but can also be used for general purpose computation and control. The Cortex-M4F cores may run any end-user-provided operating system or run a ‘bare metal app’ with no operating system. Microsoft provides a development environment based on the gcc compiler which includes a Visual Studio extension, allowing this application to be developed in C.
Microsoft is working with selected device manufacturers to build first wave of Azure Sphere devices by the end of 2018. Dev kits will be universally available in mid-2018. Chip giant Qualcomm has launched its first sytem-on-chip devices for the Internet of Things (IoT) aimed at integrating into smart cameras. The two 10nm SoCs include advanced camera processing software, machine learning and computer vision software development kits (SDKs), WiFi connectivity and security technologies. The leading edge process technology allows hardware that support AI on the chip as well as reducing the cost. The Vision Intelligence Platform combines cutting-edge processing and AI with superior imaging, which is key because so many IoT applications, of today and tomorrow, use visual information. This goes beyond security cameras to include everything from ovens to robotic vacuum cleaners and drones — any device that relies heavily on information that comes from a camera. The processing of that information could be done in the cloud, but that takes resources and time. Because the camera itself has the intelligence, it can decide how to respond based on what it knows instead of waiting for video data to be sent to the cloud and analyzed. This edge computing gives faster processing, local control, better security and privacy, and the use of less network bandwidth. Integrating this technology will also push the IoT ecosystem forward, as developers move away from the cloud and focus on the capabilities of the device. Processing data at the edge requires significant horsepower, and the Vision Intelligence Platform has eight cores, from multiple 2.5GHz 64bit Kryo 300 customised ARM cores, Adreno 615 GPU, Hexagon 685 Vector Processor, Spectra 270 ISP camera core, as well as DSPs for sensors and audio. Support for up to 2x2 802.11ac Wi-Fi with MU-MIMO, Bluetooth 5.1, a 3D Audio Suite and other audio technolgies including aptX gives a wide range eof embedded capabilities. The Vision Intelligence Platform also integrates a software AI engine called the Snapdragon Neural Processing Engine (NPE). The NPE provides analysis, optimisation and debugging capabilities that help developers and OEMs port trained networks into the platform. The AI Engine is compatible with Tensorflow, Caffe and Caffe2 frameworks, Open Neural Network Exchange interchange format, Android Neural Networks API, and Qualcomm's own Hexagon Neural Network library, so developers have the freedom to use their preferred framework. The Qualcomm QCS603 and QCS605 SoCs are currently sampling but power consumption figures are not yet available. A QCS605-based VR/360 camera reference design from camera OEM Altek is available today. A QCS603 based industrial security camera reference designs will be available later in 2018.
the world’s leading semiconductor suppliers significantly increased their marketshare over the past decade, accrding to the latest data from IC Insights’ McClean Report. The top five semiconductor suppliers accounted for 43% of the world’s semiconductor sales in 2017, an increase of 10 percentage points from 10 years earlier (Figure 1). In total, the 2017 top-50 suppliers represented 88% of the total $444.7 billion worldwide semiconductor market last year, up 12 percentage points from the 76% share the top 50 companies held in 2007. 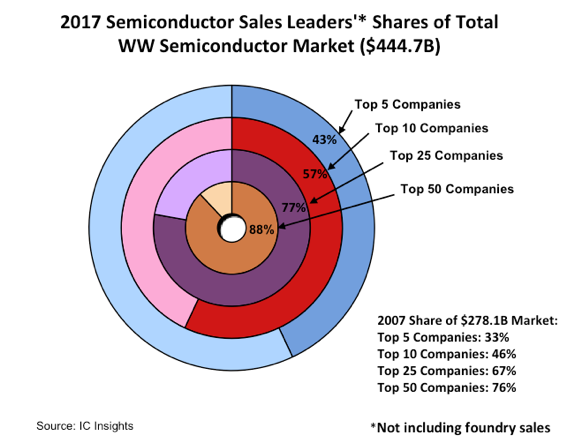 The top 5, top 10, and top 25 companies’ share of the 2017 worldwide semiconductor market each increased from 10-12 percentage points over the past decade. With the surge in mergers and acquisitions expected to continue over the next few years such as Qualcomm and NXP, this will raise the shares of the top suppliers further. 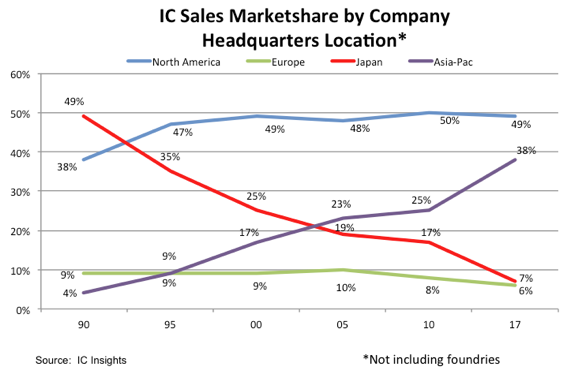 Japan’s total presence and influence in the IC marketplace has waned significantly since 1990, with its IC marketshare (not including foundries) residing at only 7% in 2017. Once-prominent Japanese names missing from the top IC suppliers list are NEC, Hitachi, Mitsubishi, and Matsushita. Competitive pressures from South Korean IC suppliers—especially in the memory market—have certainly played a significant role in changing the look of the IC marketshare figures over the past 27 years. Moreover, depending on the outcome of the sale of Toshiba’s NAND flash division, the Japanese-companies’ share of the IC market could fall even further from its already low level. With strong competition reducing the number of Japanese IC suppliers, the loss of its vertically integrated businesses, missing out on supplying ICs for several high-volume end-use applications, and its collective shift toward the fab-lite IC business model, Japan has greatly reduced its investment in new semiconductor wafer fabs and equipment and Japanese companies accounted for only 5% of total semiconductor industry capital expenditures in 2017 (two points less than the share of the IC market they held last year), a long way from the 51% share of spending they represented in 1990. RS Components (RS) has launched a completely new version of its free app that gives engineers a single point of access to common electronic reference materials, calculation and conversion tools in an easy-to-use format. The DesignSpark Toolbox app is available for iOS as well as Android and Windows for the first time, and was developed in conjunction with Marcus Roskosch, the creator of a range of highly successful apps for engineers. It replaces the RS Toolbox app, which was introduced in 2013 for iOS. DesignSpark Toolbox offers a range of functions grouped as icons on the main screen, including engineering calculators, converters and lookup tables. 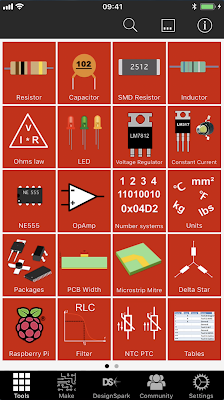 These include filter frequency calculators, a 555 timer configurator, calculators for a variety of voltage regulators and op-amps, and essential tools such as numbering systems converters, an Ohm’s Law calculator, and lookup tables for battery types and sizes. The app is customisable and is available in 17 different languages. A live streaming traffic information service in the US is being powered by machine-learning and edge computing. Trafficware has teamed up with Silicon Valley edge intelligence software firm Swim.ai for the TidalWave service. The service is based on work in Palo Alto in 2015 to provide the first open source traffic data used in connected vehicle applications. This provides streaming traffic data with sub-second accuracy using edge computing combined with a more affordable cloud service with low overhead and so there is no impact to city infrastructure. Today, the majority of routing and logistics applications rely on historical cellular GPS data to measure roadway congestion and estimate travel times. In order to determine traffic congestion on arterial corridors, the applications assume that all cell phones are located in moving vehicles and reflect current conditions. The speed and accuracy at which the data is collected, analyzed and made available is slow and often does not reflect the actual experience of drivers. TidalWave performs the traffic and signal analysis either at a city’s advanced traffic management system or on controllers at street level and generates highly accurate real-time information. The efficiency of the edge solution means that data volumes are reduced by a factor of over 100 and can provide hardware savings of up to 80% compared to traditional solutions. The service is a simple software addition to existing city infrastructure and subscribers to the Tidalwave service receive traffic information from a real-time API. "TidalWave analyzes, learns and predicts as data is created, at the edge, on existing hardware using a powerful edge compute/data fabric. It delivers precise, granular traffic data at a resolution of hundreds of milliseconds, at a small fraction of the cost of central cloud-hosted learning and prediction,” said Rusty Cumpston, CEO of SWIM. Tortuga Logic is working on a DARPA research project in the US to test security vulnerabilties on emulation platforms that are used to develop and test chip designs. This would allow designers to identify and correct vulnerabilities before the chips are made. Tortuga has developed hardware security models that identify vulnerabilities in semiconductor designs, and the project would allow that technology to be used to fully test an entire chip design running a full software stack. The iniital work will be done on the Palladium platform from Cadence Design Systems using the RISC-V processor architecture and sample design for initial prototyping and testing. As we have noted in the Embedded blog, RISC-V is gaining popularity in many market verticals and will be used as the baseline design for many of the project participants, making it a suitable architecture to validate the functionality of the final security emulation platform. The results of the project would be used by hardware designers to enhance their ability to find security vulnerabilities in their designs prior to chip fabrication or Field-Programmable Gate Array (FPGA) deployment. The project will be led by Dr. Jason Oberg, Tortuga Logic’s CEO and co-founder. “More than ever, hardware designers need solutions to identify security vulnerabilities throughout the chip design lifecycle, rather than post-fabrication or post-deployment. This contract with DARPA will allow Tortuga Logic to integrate our patented information flow technology with commercial emulation platforms, completing a full end-to-end design suite dedicated to security verification,” saidOberg. Members of the System Security Integrated Through Hardware and Firmware” (SSITH) program will receive early access to the resulting security solution for emulation platforms. Tortuga Logic’s current product line consists of two software suites, Prospect and Unison. Both products have been adopted within the semiconductor industry, as well as the aerospace and defence industry. The teechnology will be managed by Tortuga Logic’s recently appointed VP of Engineering Andrew Dauman, a former Vice President at Synopsys responsible for the Synplify family of FPGA synthesis tools, as well as the HAPS FPGA-based prototyping systems. Tortuga’s security solution for emulation platforms will be available for purchase later this year. AI (deep learning, or neural nets if you prefer) continues to be a key theme, and its good to see MIPS holding its own as an architecture with several AI design wins. Intel's open source reference hypervisor is also an interesting move, especially as the company is selling off its Wind River division which specialised in the technology.